In 1987 I was approached by my AHEPA chapter to design a Socratic award, which we would present to a deserving individual as part of our annual Scholarship Dinner. 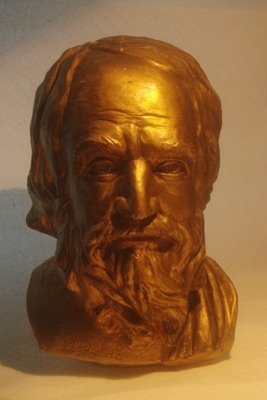 Over twenty years we presented 21 of those awards to judges, politicians, scholars, philanthropists and others, including George Stephanopoulos. The story behind this award, and the bust of Socrates, includes Theo Ianni and the way he impressed me with his demeanor and presence. As I stared working on the bust, I did some research on Socrates and his appearance. I decided that there was no accepted contemporary description of him and took some artistis liberties as I started scuplting his bust. But I still was not sure what direction I was going with it and how he should appear. What does a wise Greek philosopher of his stature look like? What makes someone look like a teacher, a scholar, a legend? This is where Theo Ianni comes into the story. I remember the way Theo carried himself as he would walk through the village. He walked like a king, with his head held high, his shoulders back, with a steady purposeful stride. I decided that Theo Ianni would be the perfect model. If you look at Socrates' face, take away his long hair and his full beard, you will see Theo Ianni. Since these statues were cast in bronze, I suspect Theo's portrait will be around for perhaps hundreds of years. I had not heard of this before, what a wonderful piece of art and tribute .